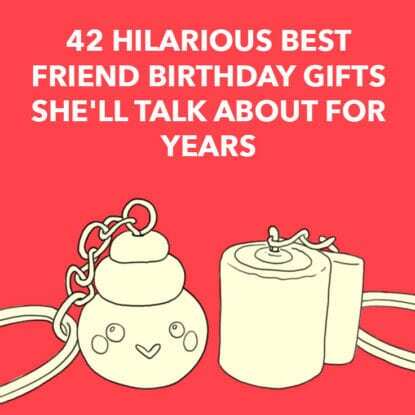 It doesn’t matter whether she’s the easiest person to buy for, choose birthday gifts for your wife is likely to bring you out in a cold sweat. But don’t panic, we’ve saved you from this annual dilemma. Our list has loads of different items, to suit every taste. We’re confident that her perfect present is in here. Everyone likes to take selfies these days and we all strive to put ourselves in the best light. This selfie kit will make getting those selfies picture perfect a lot easier. It contains 5 lenses, including a macro and wide-angle, which simply clip onto your phone and then you’re ready to snap away. Does your wife need to carry a notebook with her everywhere? 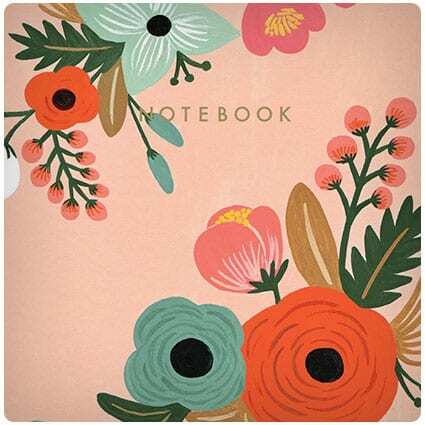 Whether she keeps these in her car, purse or her desk at work, these beautiful botanical notebooks will make sure she always has somewhere to jot down her thoughts, ideas and lists. 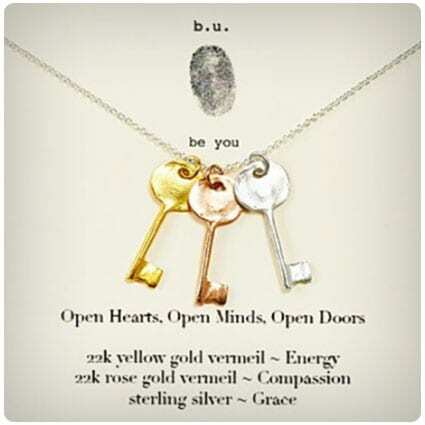 This gorgeous “Three Keys” necklace might just look like a stunning piece of jewelry but it holds a much deeper message. Each of the three keys represents something different and together, they all act as a reminder to trust your instincts and follow your heart. Was your wife a 90’s baby? The 90’s fashion is making a comeback so why not follow the trend and get her this coloring book. It features movies, music, TV and the clothes of the 90’s so she’ll really be able to reminisce while coloring in the pictures. Just don’t forget to get her some scented markers too! What more could you want? A beanie hat which keeps your head warm in the cold weather, and also has hidden earphones inside. As well as being able to transmit your music via Bluetooth, it also enables you to be able to answer phone calls without your hands having to get cold. Succulents are super trendy right now, you only have to scroll through Instagram to see that. This phone dock will be a great addition to your work desk. Not only can you slot your phone into it but the pot has room for a succulent, or maybe some desk accessories if plants aren’t your thing. This would make a perfect birthday gift for your wife, especially if she’s into plants and gardening. She can put the display on her windowsill, work desk, maybe even in the kitchen. You could arrange the plants for her or buy her the bits and let her get it exactly as she wants. Who doesn’t love ice cream? We’ve all had times when we want some of that goodness but just don’t want to go to the store. Well now you’ll be able to make some at home using this ice cream machine. It allows you to make two flavors at once so you’ll never have to choose again. Take this pouch with Mixology Dice inside along to your next party and up the cocktail game. 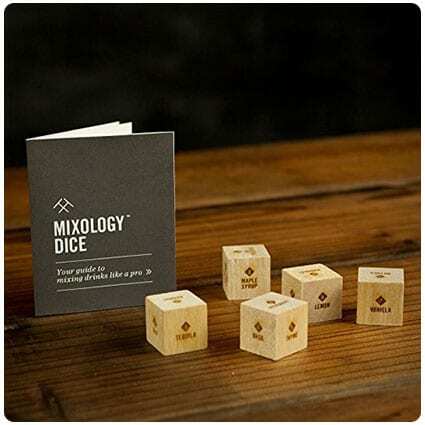 Eight engraved wooden dice, all of which have different elements which make up cocktails on, need to be rolled, and then those ingredients used to make some pretty awesome drinks. 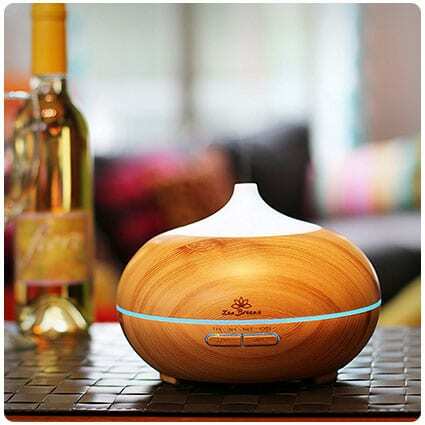 Scents can have such a calming effect on us and an essential oil diffuser is the perfect way to circulate those aromas. As well as the relaxing fragrances it releases, it also glows in the dark and omits a peaceful glow over the whole room, adding to the calming experience. These simple stainless steel measuring spoons will look at home in any kitchen. 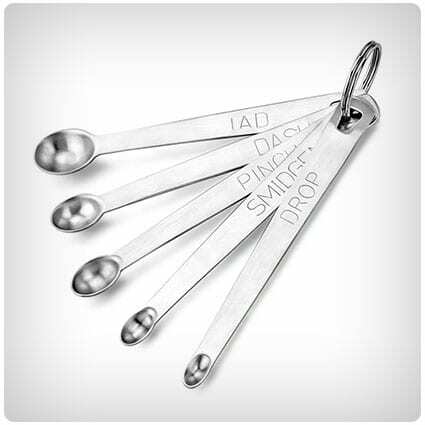 The five different sized spoons don’t have the traditional measurements, instead you’ll be working in drops, smidgens, pinches, dashes and tads. It’d make the perfect gift for a cook with a sense of humor. Put some spice back into your marriage with this journal. Open up the “Why You’re So Hot” book and fill in the pages with what makes your wife a hottie. She’ll love reading it and you’ll love filling it in, reminding yourself of all the amazing things you fell in love with. Taking full length photos of yourself can be such a pain but Echo and Alexa are here to help. You’ll be able to build your own personal lookbook by taking photos or recording 6 seconds of video, and with the built in Style Check, there’ll always be someone to give you a second opinion. If your significant other is a huge Potterhead, this cookbook will go down a treat. With recipes for Harry’s favorite dessert, which is treacle tart, and Pumpkin Pasties, which are served on the Hogwarts Express cart, they’ll be able to immerse themselves into the culinary world of Harry Potter. Make her life easier with an Echo Dot, a voice-controlled device which can answer questions, control smart home devices and even read audiobooks. Connect it to speakers through Bluetooth or a wire to listen to music and it can even call or send messages hands free too! Women played such a huge part in World War 2, yet their stories are hugely underplayed or even untold. This book tells the tale of the American code breakers, who helped break the codes of the German and Japanese forces, helping the troops get ahead of them and win the war. Perfect for a dinner party or just an evening sat in front of the fire, this wine barrel butler makes pouring wine a lot easier. Reclaimed from an old barrel, the oak piece sits snugly on top of a bottle of wine and also has two slots to fit the glasses in. You can’t beat a good cup of tea, it solves almost everything and makes us feel instantly better. But how do you know how long to let it brew for? These tea timers will tell you the perfect time to steep green, black and white tea, meaning you never have to guess again. Without a good foundation, things will crumble and that’s the same with makeup. Without prepping the skin right, the rest of it won’t sit right and will wear away quicker. Benefit have brought out this cute compact kit, containing everything a woman needs to make her face smooth and pore free. Whether her drink of choice is wine or whiskey, this personalized barrel will be a great gift. Made from oak, you can add an initial and one name to the barrel. It also comes with a stand, spigot and bung which makes filling and serving so much easier. Ideal for customizing any living or work space, a lightbox is a great birthday gift for your wife. Slide the lettered tiles into the box and make up meaningful words and phrases, then turn on the backlight and see your words come to life. It’s lightweight which makes it easy to transport too. If she’s highly into fashion and designers, this book will be a perfect gift for her, From Coco Chanel to Versace, it covers all the major names and important time periods which have had an influence on the fashion industry and made it how we know it today. Choose from gold, silver or rose gold and then have her name engraved onto the bar for a truly personal gift. The bar will hang on a 17.5” chain and will go with all of her outfits so she’ll be able to wear it every day and for any occasion. Beauty comes from within. We’ve all heard that saying, right? It’s certainly true in the way that what we eat can affect our skin on the outside. This book gives you all the nutritional hints and tips which can help you eat yourself pretty. You won’t need the expensive creams anymore, just good and wholesome food. Finally, somewhere for her to keep her bottles of wine without taking up space in the refrigerator. The vertical wine cooler from IGLOO can hold 4 bottles of wine and has an adjustable temperature control, meaning you’ll always get the perfect glass of red or white. There is nothing a lady loves more than a good bottle of perfume and this Chanel one will put you in her good books for sure. This woody and amber scent has underlying notes of patchouli, vanilla and tonka bean which will shroud your woman in a deliciously warm and sweet scent. Hanging on a delicate silver chain is this cute pendant design. Made from sterling silver, the paper airplane can be personalized to have your loved one’s initial on it to make them feel truly special. Whether they love to travel or a bit of a kid at heart, this necklace is sure to be well received. We’ve all seen Beauty and the Beast. The rose inside the glass bell jar is such an iconic item and something every fan of the movie would love to own. This hand cream is presented within a glass dome, giving the impression of the jar from the film. Having home grown herbs around the house is a wonderful thing. Not only do they smell amazing, but they look good too. And adding them to your cooking is a joy. You’ll be able to grow your own with this 3-step gardening kit – it couldn’t be simpler. Llama items are fast becoming as popular as unicorn ones and it’s not hard to see why with this adorable mug from Firebox. Made from high quality ceramic, your drink will stay warmer for longer and the cute Peruvian towel design adds a splash of color. This will quickly become the office’s new favorite game. Build up the towers and catapult the cats into them as fast as you can. You get 1 point for a kitten, 4 for an adult cat and 6 points for a fat cat. Rearrange the towers into more elaborate structures to make this paw-some game more challenging. Add this amazing tool to your kitchen and you’ll become a sous vide master. Slimlined and sleek, it has the ability to connect to your phone via Bluetooth or WiFi so you’ll be able to turn it on wherever you are. You’re guaranteed perfect results every time. Give your wife the birthday gift of beauty sleep for her birthday this year. This all-natural sleep mask is made from breathable silk and linen, making it comfortable to wear in all weathers. It’ll block out all light so she’ll be able to get a full night’s sleep, even if you decide to pull open the blind at 6am. A perfect mix of blushers and lip glosses, this would make a great gift. These travel sized products from Too Faced will give you an idea of how the products look on you and then you can go out and buy the full sized ones. Bring a touch of the tropical to your drinks cabinet with these brass plated pineapple shot glasses. Your guests will love it when you bring them out, as they look so sophisticated and elegant. Fill it with 2oz of your favorite spirit and get the party started. 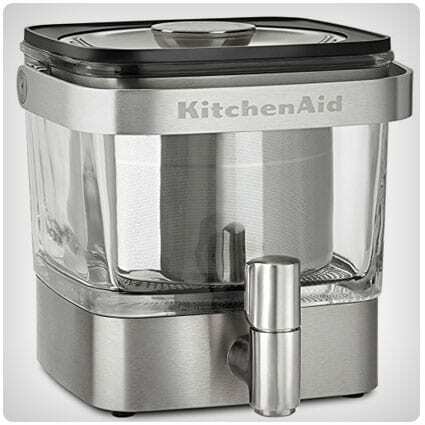 Whether you prefer iced coffee or iced tea, this Kitchen Aid Cold Brew coffee maker will give you your cold drink of choice in the comfort of your own home. Fill with coffee or tea, add milk, water or ice and you’ll feel like you’ve bought it from your favorite coffee shop without stepping foot outside. Ease the aches and pains of your long day with this colorful and fun flamingo neck warmer. Pop it into the microwave and it’ll stay warm for hours. A soothing lavender smell wafts gently from it and you’ll feel instantly relaxed, and it’ll keep you warm on cold winter nights – you can rid of that old water bottle now. If you’re on any form of social media, you’ll have seen a variety of memes. You’ll now be able to show off your favorite memes on your refrigerator or turn your favorite photos into new ones which will make your friends and family laugh. 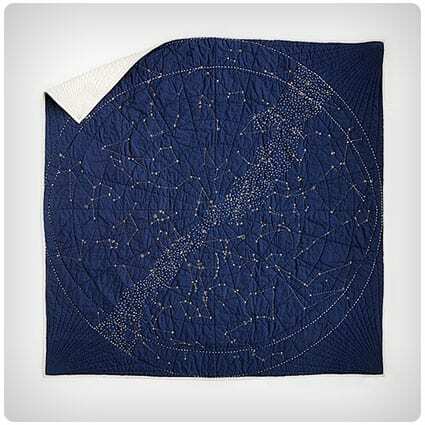 If you need a birthday gift for your wife, this deep blue constellation quilt will make an amazing present. Looking up at the stars is a timeless thing to do and now she can fall asleep under them in the comfort of her own bed. Coat racks are great things but sometimes they get in the way. However, this ingenious invention has solved that problem. 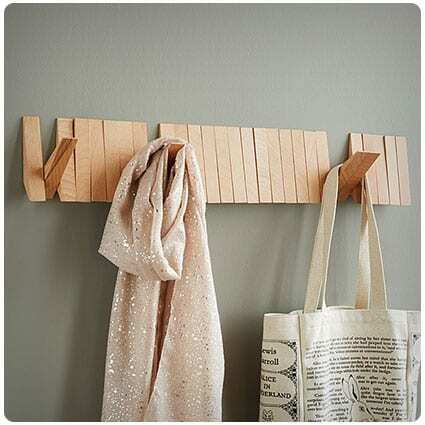 25 triangles made from beechwood flip down to hold your coats, hats and scarves but when you don’t need them, they’ll fold up and out of the way. If your spouse is a keen artist, she’ll love this watercolor book. Through reading this book, she’ll learn some amazing hints and tips on how to bring a new dimension to her watercolor paintings. Every artist wants to tell stories through their work and this will definitely help her achieve that. There are so many products out there which tell us that they’ll work wonders for us, but do you know what’s actually in them? This homemade coffee soap will not only use up your used grounds but it’ll keep your skin soft and supple with the added Vitamin E oil. Make this lip balm using natural ingredients which you know are good for you. You could even add some of your favorite lipstick for color or some candy flavoring to make it taste delicious. Pour it into cute containers and either give them as gifts or keep some for yourself. Heat packs are a great gift to give, they look so much cuter than a hot water bottle and they’re easier to warm, too. But instead of buying a generic store one, why not follow this tutorial and make some yourself. It’s super easy and they’re sure to get a gift they’ll love.